Line Dutch Oven with foil. Combine blueberries, Eagle Brand and lemon peel. In a large bowl, cut 3/4 cup butter into 1-1/2 cups biscuit mix until crumbly; add blueberry mixture. Spread into your dutch oven. In a small bowl, combine remaining 1/2 cup biscuit mix and sugar; cut in remaining 2 tbs. butter until crumbly. Add nuts, sprinkle over cobbler. Bake 40 minutes over medium heat. Remove from the fire, add top coals and continue baking until golden brown. Serve with ice cream. Sauce: Combine sugar, cornstarch, cinnamon and nutmeg. Gradually add 1/2 cup water. Cook and stir until thickened. Stir in blueberries; cook and stir until hot. Pour over individual Streusel servings. Don’t forget that our annual Job Fair is being held in the upper level of the Santa Claus American Legion this Saturday, February 5! 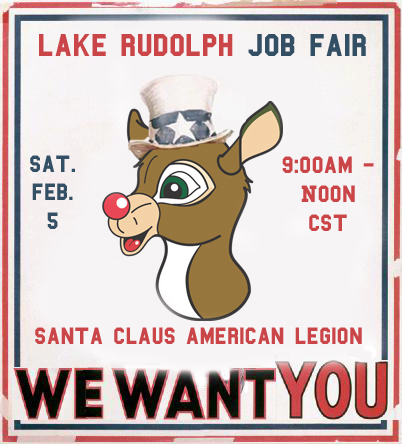 We’ll be hiring up to 130 seasonal workers for both Lake Rudolph and the Santa Claus Christmas Store. I couldn’t resist giving Rudy a cute, Uncle Sam look for the occasion. So, what’s your fancy? Are you good at customer service and taking reservations? There’s Call Center for that. Are making pizza and milkshakes your thing? There’s Blitzen Kitchen for that. If you like being outdoors then Grounds and Maintenance has you covered. Are you artsy and have great penmanship? Then consider being an ornament personalizer at the Christmas store. Stop in and see us anytime between 9:00am and Noon CST to fill out an application and speak with representatives from each department. Or fill out an online application and return it to us no later than March 11, 2011.